A crackled, distressed, glittered snowman, who's WISHING she had all the supplies she needed, but instead will be adding things from the "I don't really need that list", to the "I really have to have it NOW list". The Background was created with Broken China, Tumbled Glass and Stormy Sky Distress Inks, snowflakes are stamped in Broken China. 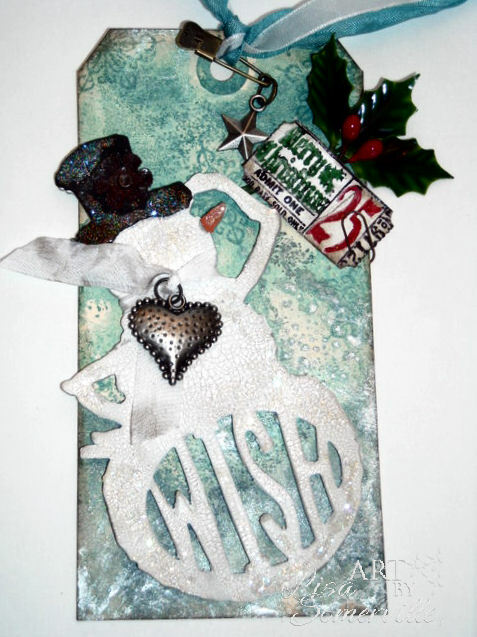 I added Glossy Accents and SU's Dazzling Diamonds Glitter to add the "snow" to the snowman. The ticket stamps is from Tim's 100th Collection, I inked in versamark, colored with markers then clear embossed to get the finished look, then sponged on Walnut Stain Distress Ink. Tim's Day 2 Tag shows how he custom makes the ink pads to get this look - I'll be back later today with my version of Day 2! Funny thing about the house die, is that I was not going to buy it and then did! Now that I have seen what Master Tim shared, so glad I did!! Love your improvised tag! So cool! Hope Lou is almost back to normal! Wow, fabulous tag, love that background and your snowman is beautiful, cute embellishments too. Excellent work. What a great combination of materials! I really like how the snowman has the word wish cut out of it. The added charm is great! I really like the whole thing! It goes to show that we can really stack technique over technique! ....and this worked out just snow-onderful! Your tag is wonderful Lisa! Seems most of us were about improvising on day 1.
such a great tag and we can always add to our wish list. Great colors and love the sparkle! Fabulous tag! Love the distressed background and the ticket and snowman and everything... :) Wonderful take on the day 1 tag! Oh lisa, how I understand your comments! I tried to "guess" what Tim might use -- and never even guessed he would use the rickety house die! It is now on the way to me! I keep hoping AC Moore will get these things in and I can use a coupon. I am not sure how much longer I can hold out! Tonight is when I can work on the tags for Day One and Two. I do not even have the snowman die! We are all going to be broke. And your tag is beautiful. Really clever how the quote forms part of the snowman, love this tag Lisa. ♥ ♥ ♥ that snowman die cut ... such fabulous detail on your tag design ... thanks for joining the Frosty Fun at Gingersnap Creations. I adore your snowman! Fabulous! Me again! Just love this one, the snowman looks great. Thanks for sharing your great idea's, love the use of the crackle and distress inks, my mind is on the run with all this info. Great tag Lisa ... sorry I took so long to come see it ... Thank you for joining the team at Simon Says Stamp and Show!